Here’s a great letter about LCHF success but with an important question. I hope you enjoy Norman’s story – it’s a nice one about improved weight, energy and health. Great blood results, but some concern about protein. In fact, its been a big week for protein. The story about two research papers lead to headlines like “High protein as bad as smoking” (see detailed comments I’ve made at the end of this blog). So today we’ll look at Norman’s story, and think about the role of protein. Following the recent post on your blog from Andrew, I thought I would share my indicators and also raise a question. I am a 51-year-old male and switched to a LCHF diet just over 6 months ago. When I started the new eating regime I weighed 93kg with a BMI of 27.5, now I weigh 86kg and have a BMI of 25.4. I lost weight rapidly at first, losing 5kg in the first 2 months. Weight loss then slowed, and rose slightly over the Christmas holidays (Mince tarts and Christmas pudding being my undoing!) but since late January has again continued a slow downward trend. In terms of getting a healthy BMI I would like to get down to about 80kg, which would place my BMI at 23.7. While weight loss was my first goal, I was also concerned about my overall health because I have always had a ‘sweet tooth’. When my older brother was diagnosed as pre-diabetic a couple of years ago, I was concerned about going the same way. Two years ago I had a badly infected gall bladder removed, a 4-week period of my life when I quickly lost 10kg (From 98kg to 88kg). I had hoped to keep that weight off, but despite being ‘good’ about portion sizes and snacking between meals I found my weight just crept up again over the ensuing year and a half. Then I discovered LCHF. For breakfasts I have settled on a fruit salad with a sprinkling of nuts (Pure Delish’s “No Grain-ola” is my current favourite) and cream. While the fruit has a relatively high amount of sugar, I consider the nutrients in fresh fruit outweighs the disadvantages, and this sets me up for the day. About twice a week I have fried bacon and eggs for breakfast instead. For lunch I have a handful of nuts, or about 100gm of hot roast meat from the local deli. Occasionally I have salami and cheese or similar. For dinner I usually have a home-cooked meat-and-veg meal, with only low carbohydrate veges. During the day I seldom snack, but have a couple of coffees with cream. I also drink 500ml of full-cream milk mid-afternoons (which causes many comments at work!). About twice a week I will have an Atkins-diet snack bar, which has high fat and a few grams of sugar. I also succumb to iced coffee’s a few times a week (despite knowing they are high in sugar!). So I probably have slightly more sugar than the ideal, but as long as I feel good and the weight is very slowly still dropping I am happy. What has amazed me about the past six months is how my ‘sweet tooth’ has disappeared. When people at work bring cakes or chocolate I have actually no desire to have any, and that is not just self-discipline. When I was coerced into eating some chocolate some weeks ago I found it unbearably sweet and stopped after a single piece. Like Andrew, I am not hungry during the day (in fact am seldom hungry at all, even at mealtimes. I eat meals because it is mealtimes, not because my stomach is grumbling). During the day I find myself having to avoid snacking just for something to do – the mid-morning coffee break and muffin was a welcome distraction, and is not quite as distracting with just a coffee. Yet I have plenty of energy and have eliminated the three-thirty-itis that for years has been a common feature of my working days. I feel great, and enjoy my meals. All of which are well within the ‘good’ limits, especially my TG.HDL ratio. The biggest change I note is my triglycerides have halved, and as a result my TG/HDL ratio is also dramatically better. However, during my medical exam this morning I also had a urine test. This showed some evidence of proteins in my urine. My GP said that some recent studies had showed that higher protein levels have been shown to have long-term health issues. Although I am not specifically increasing my protein intake on LCHF, the nature of it means for example that for lunch I may have a slice of hot roast ham (with crackling!) whereas before I would perhaps have had a carb-laden muffin.So it is conceivable that my protein intake has increased overall, since most high fat snacks also contain a fair amount of protein. Any comments on the protein indicator in the urine test? My GP is not convinced that LCHF is necessarily a good diet, although concedes my weight loss and all the indicators show it is working well for me. I have to say he is a bit old-school, like much of the medical fraternity, but I am working on him. First up – nice work Norman. Love it and thanks for sharing. Let’s have a think about protein. Over consuming protein means extra glucose as the liver, through gluconeogenesis, turns that protein into carbohydrate. This may be a factor in some people stalling or not losing weight on LCHF diets – they are over-consuming protein and still giving the body a high glucose load, raising insulin and all the downstream metabolic effects. Protein is associated with the production of Insulin-like Growth Factor 1 (IGF-1). IGF-1 is necessary for life, but over production may be part of the causal pathway for all metabolic diseases. People with kidney disease may need to be careful about over consuming protein as this can cause protein toxicity. Protein toxicity occurs when the body is unable to get rid of the potentially toxic wastes that are generated as a result of protein metabolism. Several studies, however, have found no evidence of protein toxicity due to high protein intakes on kidney function in healthy people. So, I think that all means that if you are on a low carb eating plan, it’s best to be careful about overeating protein if you are prone to being insulin resistant. If you have any kidney disease then its even more important. I keep an eye on my intake from time to time using online apps like easy diet diary. I have a tendency to eat too much protein and need to watch this. 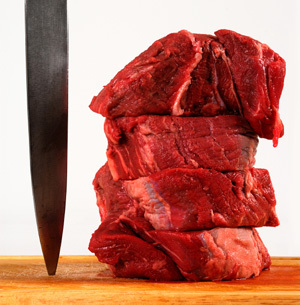 What about the recent research showing that high protein intake is “as dangerous as smoking”? There’s been a big deal in the last 10 days made about two studies in the journal “Cell Metabolism”. It’s all about the over-consumption of protein and mortality, especially from cancer. My take: First, this is a cross sectional study and can never show cause and effect. It may be that higher protein intake produces more IGF-1 and affects tumour growth and the development of other metabolic issues. That’s one reason why we advocate an adequate protein diet (around a gram of protein/kg per day plus a bit more if your are very active or doing resistance training). Second, carbs also raise IGF-1. So the logical best diet to reduce levels of IGF-1 being chronically high is a low carb high fat diet with adequate protein (exactly what I advocate for). That said, this study can build a hypothesis which can be tested in trials. It’s not the basis for public health recommendations. Another example of nutrition science headlines going beyond the data. Remember that across the WHOLE population in this study, there was NO effect of protein, AND only an ASSOCIATION in a sub-group analysis. Let’s not draw too much out of this study. They probably are onto something about excessive IGF-1, which is great to see as we have been talking about that for a while. This study was a mouse model and in my opinion went well beyond their data and made conclusions that were simply not robust. A few things worth noting. First. hidden in the supplementary material we see that they only report 25 of the 30 diets because they culled diets for mice who “failed to thrive” and were removed from the study (see more below). Second, they fed them synthetic food made from soybean oil, two amino acids, sucrose and dextrose. Third, they didn’t report median life expectancy as the main outcome when they should have. Last, mice have a different carbohydrate and protein metabolism to humans so extrapolating to human life expectancy is a long shot. Here are some comments on the study spotted by the vigilant (and more robust apparently) lay peer review process (Rory Robertson from the Ozparadox.com in this case). Why were 100+ sick mice – all on low-protein diets – excluded from longevity results? The original study reportedly involved 30 diets and nearly 1000 mice: see here. Yet the published paper reports the results for – amongst other things – “…longevity in [only 858] mice fed one of [only] 25 diets ad libitum”. I’m trying to understand why five of the 30 original diets – all low-protein diets – were excluded from the final results. Failure to thrive! Imagine the disappointment of those 100+ sick/dying mice – ALL on low-protein diets – when they were told that, sorry, we’re going to euthanize you and then exclude you from this longevity study. It’s a longevity study – sick and dying mice are the main thing we are looking for! Yet they were excluded. Why? My observation is that the study’s high-profile “finding” – that lower-protein diets boost longevity in mice – is NOT ROBUST when the analysis is properly REBALANCED – by excluding the five most-unhealthy high-protein diets – to properly adjust the design for the low-profile exclusion of the most-unhealthy low-protein diets. Moreover, to properly capture the underlying reality of the published results, it makes sense to focus on MEDIAN not maximum lifespans. Checking the medians for the remaining 20 diets, the claimed boost to mouse longevity from low-protein diets has disappeared: the TOP-2 diets now are HIGH-protein, as are FOUR of the TOP-7 diets. Doesn’t ditching those five obviously unhealthy low-protein diets – involving 100+ sick/dying mice! – by itself invalidate the paper’s claim that low-protein diets boost longevity in mice (and so humans)? In my opinion, the study’s longevity “findings” should be re-written to properly reflect the underlying results from ALL of those original 30 diets, including the longevity of ALL those nearly 1000 mice. As things stand, the public is being misinformed by this research claims and interpretation. Science media is a mess, especially in nutrition, and you will have to do some research to make any informed choice. Protein is essential for life, but over-consumption might be an issue – we still don’t have the full answer. In my view, eating whole plants and animals provides about adequate protein and nutrient dense food to make thinsg work for most people most of the time. This is also lowish in carbs, and higher in fat. I would like to see Norm eat a large leafy green salad for lunch with a little protein with it (small can of salmon/ an egg/ cheese)…green veges then fats then proteins………….swap some of your meats and full fat dairy for lettice, broccoli, spinach etc…..just a thought?? Why? “Veggies are super healthy” and “ya gotta have fibre” is just more conventional wisdom BS right up there with “bad cholesterol” and “artery clogging saturated fat” etc. Interesting questions about how the mice population may have been shaped to the desired outcome of the study. I’m interested in learning more about the desired level of protein for my situation. Is there a graph referencing protein intake considering BMI and activity level? A friend was asking me about my thoughts on the university paper re the mice, carbs & longevity. I found your lay person’s contributions,reflections & observations so very well formulated & helpful. I am going to send Rory’s response on. It seems to me a fair bet sections of the community hearing about LCHF diets would worry about over consumption of proteins. It is refreshing to see you Grant, & Rory, giving such constructive feed back. The media make nutritional topics a mine field for readers. Irresponsible reporting that sensationalises certain view points must leave people in a quandary of what indeed there is left to eat. And on the other hand I find some nutritionists’ concerns about clients over indulging in too much fat & protein understandable too. What I can’t ‘get’ is why the research got through to be published when it had so many flaws. In my mind it renders it a load of hot air & leaves me wondering deeply what was/is their agenda? I smell a rat/mouse. I am confident you & others are making a difference, & that the change will be exponential thanks to all of you who pioneer for a healthier community. We love watching the videos from your conferences and look forward to more. Hope you enjoy it as much as we enjoy yours. Hi there, I haven’t read all the comments so hope this wasn’t mentioned before, protein content in urine has nothing to do with protein in the diet. It is actually an indicator of kidney disease/failure. Norman should have his kidney function tested, if should include his creatinine levels, flow rate and protein output. Very very important! If his kidneys are a problem then LCHF is not the diet for him. My sister had a kidney disease that eventually led to kidney failure, and her markers were protein in her urine. She had some success following a vegan diet which slowed the protein spilling (and with that the damage to her kidneys) but eventually she lost her function completely. Please get your kidney function checked Norman. I think the main think is an LCHF diet isn’t a high protein diet which might cause kidney problems for the suspectiable. Its adequate protein and you should be fine. Hi, how I can work out what the right amount of protein is?